Zen reports callback charts reproduce the functionality of Zen charts in Zen reports. All of the chart types and a majority of chart properties available in Zen are also supported by Zen reports callback charts. For information on Zen charts, see the Zen Charts chapter of the book Using Zen Components, especially the section Types of Chart, which describes all the chart types supported by Zen and Zen reports. Documentation for an earlier charting implementation, called XPath charts, is available in the section Using XPath Charts in Zen Reports in this book. A small number of properties are handled differently by Zen pages and Zen reports. In general, because Zen reports are not interactive, callback charts do not support Zen chart properties that rely on the interactive nature of Zen applications. The following table lists properties that are unique to Zen reports, or behave differently from their Zen page equivalents. bandLeft Decimal value. If defined, the chart displays a vertical colored band on the plot area covering the range lower than this value. bandLeftStyle defines the style of this band. bandLeft and bandRight are applicable only to charts that have a value axis as the x axis, such as <xyChart>. bandLeftStyle SVG CSS style definition for the band defined by bandLeft. bandRight Decimal value. If defined, the chart displays a vertical colored band on the plot area covering the range higher than this value. bandRightStyle defines the style of this band. bandLeft and bandRight are applicable only to charts that have a value axis as the x axis, such as <xyChart>. bandRightStyle SVG CSS style definition for the band defined by bandRight. Specifies a callback method which provides data for Zen reports callback charts. Zen pages also support ongetData, but the method you supply is different for Zen reports. See the section Providing Data for Zen Report Charts following this table. Specifies a callback method which provides labels for the x-axis. Zen pages also support ongetLabelX, but the method you supply is different for Zen reports. See the section Zen Reports Callback Methods following this table. Specifies a callback method which provides labels for the y-axis. Zen pages also support ongetLabelY, but the method you supply is different for Zen reports. See the section Zen Reports Callback Methods following this table. Specifies a callback method which the chart calls to get names for the data series. The chart passes the method an argument that contains the 0-based ordinal number of the series. See the section Zen Reports Callback Methods following this table. passChartObject Controls whether the chart passes the chart object to the ongetData callback method. Should be used only to provide backward compatibility for code written for earlier versions that did not pass the chart object. seriesCount In Zen pages, you must provide values for the property seriesCount if the chart does not get its data from a data controller. Zen reports do not use data controllers, and handle seriesCount differently. If you do not specify this parameter, it is calculated from the data provided by the ongetData callback method. If you do supply a value, the chart uses it to determine how much of the available data to use in the chart. seriesSize In Zen pages, you must provide values for the properties seriesSize if the chart does not get its data from a data controller. Zen reports do not use data controllers, and handle seriesSize differently. If you do not specify this parameter, it is calculated from the data provided by the ongetData callback method. If you do supply a value, the chart uses it to determine how much of the available data to use in the chart. Zen reports charts have several attributes that specify callback methods used to provide information to the chart. ongetData, ongetLabelX, and ongetLabelY are also supported by Zen pages, but ongetSeriesName is unique to Zen reports. See Plot Area for a discussion of ongetLabelX and ongetLabelY in Zen pages. The section Providing Data for Zen Reports Charts discusses ongetData in detail. The following code example illustrates all of the callback methods. The methods for ongetLabelX and ongetLabelY use the chart object to determine whether the chart is pivoted and supply labels to the correct axis. /// This XML defines the logical contents of this report. /// This XML defines the display for this report. /// This is used to generate the XSLT stylesheets for both HTML and XSL-FO. Note that all data acquisition and processing for the chart takes place in the ongetData callback method. For this reason, the chart content does not reflect any structure or data organization that may be present in the XData ReportDefinition or XData ReportDisplay sections of the report. In the first example, the XData ReportDefinition is essentially a place holder. The real work is done in XData ReportDisplay, which defines the <cbarChart>, and in the ongetData callback method getchartdata, which uses SQL to get data from the database. The callback then uses the result set to fill the array passed by reference. 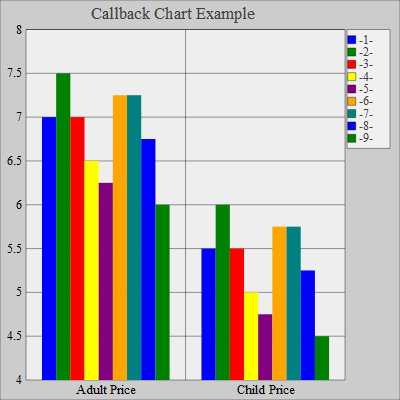 <document width="8.5in" height="11in" marginLeft="1.25in" marginRight="1.25in"
"SELECT TheaterName,AdultPrice,ChildPrice FROM Cinema.Theater ORDER BY TheaterName"
In the next example, the XData ReportDisplay block and the method getName are identical to the previous example, and have been deleted. This example takes an approach similar to that used by the older, XPath charts. The XData ReportDefinition uses SQL to get data from the database, and uses the result set to create an intermediate XSLT document. The callback method accesses that document and stores data from it in the array. For more information, see Evaluating XPath Expressions in the book Using Caché XML Tools. xmlfile is a Zen report property that contains a string which is the fully qualified name of the generated file containing XML. It should not be set by the user. It can be used by callback charts as a source of data that can be manipulated through the XML XPATH and XSLT processors. xmlfile is defined when processing takes place on the server. It is not defined when processing takes place on the browser. The section Setting Zen Report Class Properties from the URI includes an overview of when processing occurs on the browser or the server. The code sample in the section Getting Data from XML illustrates the use of xmlfile as a source of data.